To easily find my crafts, click on the Tutorials tab above. To stay on top of the latest, don't forget to subscribe to my YouTube channel at www.youtube.com/craftklatch. You can find the candy mold above in the Craft Klatch Products I Use - Amazon store. 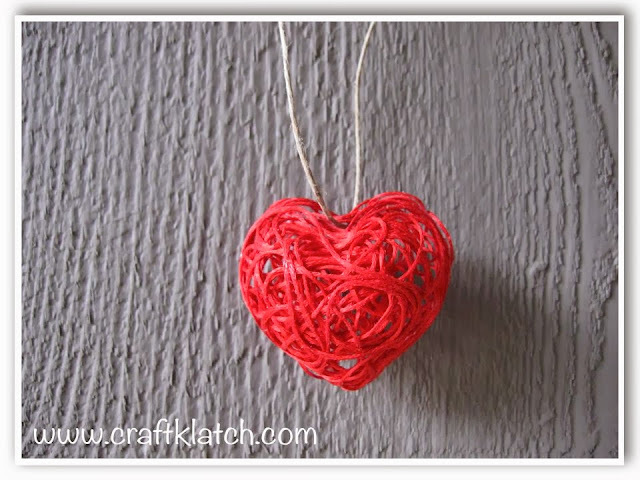 I was asked by one of my YouTube subscribers to do more string crafts and this is one for Valentine's Day. 1. Carefully unwind your embroidery floss into the starch. Make sure to keep the end out. 2. While you are pulling the embroidery floss out of the starch and winding it into the mold, make sure you are using your other hand to pinch off any excess. You don't want the starch to pool at the bottom of the mold. 3. I did not make a solid heart. I just wanted the shape and I wanted it to have some openings. 4. Allow to completely dry. 5. When dry, they should easily pop right out of the molds. Use a glue that dries clear to glue the two halves together. DO NOT use hot glue. I originally tried hot glue and when I tried to pull off the glue strings, it pulled my heart apart. Elmer's glue would work fine! 6. When the glue is dry feed twine or fishing line through openings at the top of the heart, tie and hang! So cute! Thanks for the tut! Thank you for stopping by! I'm trying to figure out how to make it into a necklace. It's too delicate the way it is, so I'm trying to think of the best way to make it more permanent. I will absolutely try to remember about Thursday! I'd love to share! That is super cute! Love this idea. But....I can't see the video. Maybe it's just me? Thanks Tessa. I'm linked up! So cute! Thanks for sharing with the Clever Chicks Blog Hop this week; I hope you’ll join us again! Love this! About how long does it take for the starch to dry then the glue to dry. Am wanting to do this at a classroom party but need to know how long it would take. Thanks so much! Hi Mike! Thank you so much, I'm glad you like it! I let the starch dry overnight, just to make sure it was fully dry, but I don't think I needed to. Of course, it depends on the humidity level where you are. The key is to make sure when you are taking the embroidery floss out of the starch that you are pinching it to drain as much of the starch out before putting it in the mold. That cuts down on the drying time and the starch won't pool in the bottom of the mold. If you are someplace warm and you can put them out in the sun, they could dry in as little as an hour depending. The glue dries pretty quickly and both halves are so light they don't have the tendency to pull apart. If you use a fast drying glue, it could be minutes. Thank you so much for the video tutorial!! I love this string heart very much. It will make a super cute pendant! So super cute!! I would not have thought about using a candy tray! Cute idea. I want to try it for turkey tummies using yarn ... wish me luck! Here is thought; Turn the candy mould upside down and use the protruding rear side of the shape. this allows for smooth straight edges to glue two sides together easy. Winner of Scrapbook Pendant Giveaway!